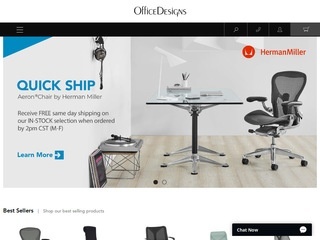 OfficeDesigns.com - Aeron Chair by Herman Miller, Eames, Embody chair, Knoll Furniture, Steelcase Leap Chairs, Kartell and other Office & Home Furniture. Know any officedesigns.com coupon code/deal not listed here? Please post it & share! Note: Any officedesigns.com coupon codes and deals listed on these pages may have expired or be invalid. Where possible we have listed the expiry dates we believe apply, but these dates are not guaranteed to be accurate.